It’s morning in the woodland, 79 million years ago, and the sounds of the forest greet the rising sun. Within a cluster of Gunnera plants, a male dromaeosaurid displays his plumage to a somewhat uninterested female, while a pair of mammals dash across the earth. A sudden, triumphant bellow sends the dromaeosaurids darting into the trees, leaving the mammals to forage in peace. The bellow came from a young male Hadrosaurus foulkii, the most common dinosaur of the woodland. Typically, Hadrosaurus foulkii travel in closely-knit herds, but males are often exiled, only to return to the herd during mating season. Being solitary means that this young male Hadrosaurus foulkii lacks the protection of the herd, and is an easy kill for the predators of the forest. Yet predators aren’t the only threats in these woods. The young male hadrosaur stops to browse on some tall shrubs, without a whim in his mind, but suddenly, with the volume of a ship horn, an immense bellow from behind the shrubs makes the young hadrosaur jump. The emperor of these forests has arrived. Meet Ornithotarsus immanis. This 39 foot, 7 ton male is twice as long and three times as heavy as the 20 foot, 2 ton young male Hadrosaurus foulkii. A whole herd of the giant hadrosaurs emerge from the forest, prompting the young Hadrosaurus to flee. These gentle giants pose no threat to the smaller hadrosaur, but instead use their bulk to tip over trees and defend themselves. The herd of Ornithotarsus is on their way to the highlands, where they will graze on the various plants which make up the highland’s plains. But there’s a catch. The wet season, while giving life to the plants the Ornithotarsus herd will feast on, leaves the highlands wet and cold, no place for an exposed hadrosaur. These hadrosaurs, however, have a remarkable adaptation. Unlike the hadrosaurs of the lowlands, who bear scutes over their body save for the occasional bristle-like proto-feather ancestral to the order ornithischia, a thick pelt of modified proto-feathers insulate the Ornithotarsus immanis while they occupy the highlands. They are, indeed, woolly hadrosaurs. But their are other dangers awaiting the O. immanis on their journey to the highlands. packs of dromaeosaurids occupy the highlands year-round, and harass the herd of hadrosaurs in an attempt to pick off the young. Harsh storms also pose a threat, and often young, old, and weak hadrosaurs are separated from the herd during these tempests, and are left to find their way through the woods back to the herd or die in the dark forests below the bald peaks of the mountains. The herd advances on. So far, only two individuals have been separated from the herd, neither of which being juveniles. The herd is almost to the end of their 170 mile, 3 day long, 2500 foot verticle climb to reach the highlands. There is, however, one more challenge they must face. The rock fields of the outer highlands are a nesting site for large azhdarchid pterosaurs. With wingspans of up to 30 feet, and heads shaped like swords, these flying archosaurs can injure even adult Ornithotarsus. The hadrosaurs have also developed a trick for dealing with the pterosaurs. Ornithotarsus bellow as a means of communication, but they also use their calls as a means of intimidation. The azhdarchids, for one, are terrified of the hadrosaurs’ loud bellows, and take to the skies as soon as they hear the first call, leaving the herd to safely pass between the rock fields. The herd finally arrives at the highlands. In front of them lie the highland plains, and they waste no time in indulging themselves, the wind howling across the expanses of plant littered earth. What we have of Ornithotarsus consists of a partial tibia, fibula, astralagus, and calcaneum (Prieto-Marquez, Weishampel, & Horner, 2006). 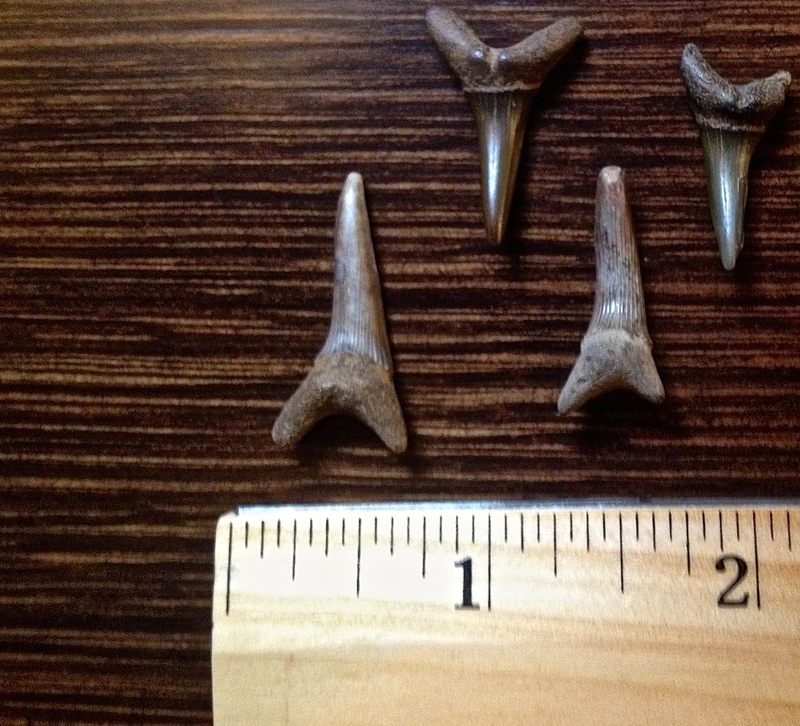 These remains possibly hail from the Woodbury Formation of New Jersey (Colbert, 1948). The animal itself was apparently enormous (Colbert, 1948), with an estimated length of 39 feet (Holtz, 2012). In his 1948 paper, Edwin Colbert described the animal as follows: “This seemingly represents a very large hadrosaurian, larger then any others known from the eastern Cretaceous, but until additional material is forthcoming nothing definite can be said concerning this supposed species.” Sentences like that get me excited. 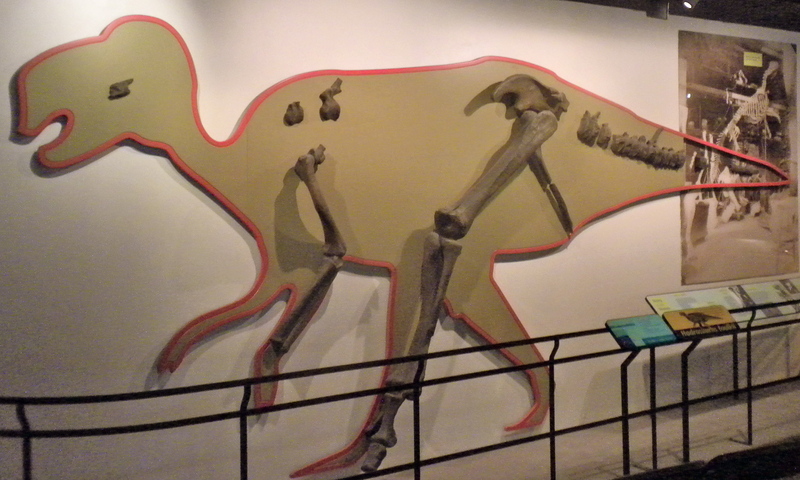 If Ornithotarsus was the large hadrosaur Colbert suspected it of being, it would be the largest known terrestrial-animal from the Woodbury Formation. Ornithotarsus consists of one species, O. immanis. Like many other dinosaurs from the Eastern US, it has been considered a nomen dubium by some workers (Prieto-Marquez, Weishampel, & Horner, 2006), and a synonym of Hadrosaurus foulkii as well (Baird & Horner, 1977) (Weishampel & Horner, 1990) (Horner et. al., 2004) (Weishampel, 2006). Colbert (1948) makes a good point, noting that the fragmentary nature of the Ornithotarsus immanis material causes anything said about the animal to be tentative at best. So what exactly can we say about O. immanis, even if the statement is tentative? If Ornithotarsus immanis does hail from the Woodbury Formation, it is likely this gargantuan hadrosaur co-existed with the smaller H. foulkii. These animals might have co-existed by exploiting different food sources in the same I have suggested before concerning other hadrosaur genera. So what of (tentative) classification? Prieto-Marquez, Weishampel, & Horner, (2006) classified Ornithotarsus immanis as an indeterminate hadrosaurid, and based on Colbert’s statement, this seems to be the best we can do in terms of the classification of Ornithotarsus immanis until more complete specimens are discovered. Casts of Hadrosaurus foulkii fossils displayed at the Philadelphia Academy of Natural Sciences, Drexel University. Photo from Wikipedia. 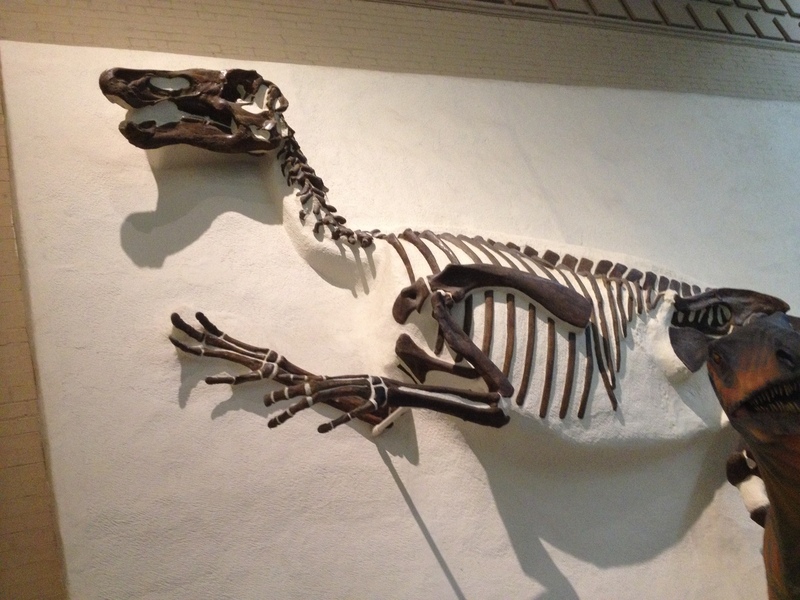 Besides Hadrosaurus, a variety of other animals are known from the Woodbury Formation. 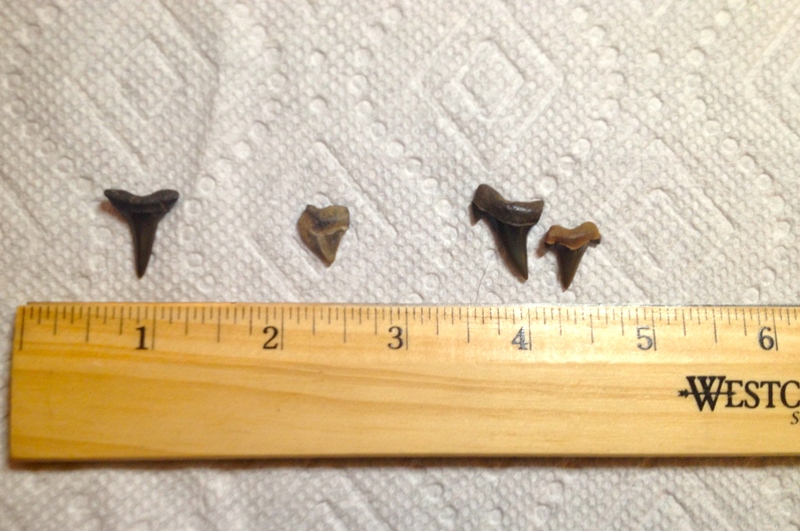 Hence the fact that the Woodbury Formation is a marine deposit, specimens of the shark Scapanorhynchus texanus, the fish Enchodus, and the sea turtle Catapleura repanda have been collected from the formation (Gallagher, 1993). 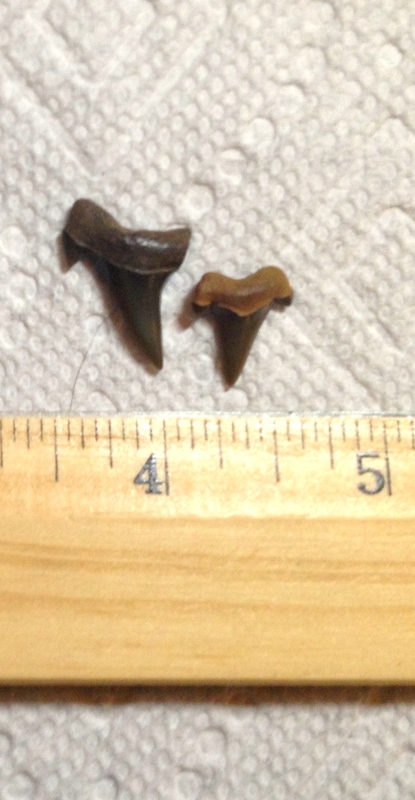 Scapanorhynchus texanus teeth. Photo by the author, 2015. Ornithotarsus immanis (if the remains do persist to the Woodbury Formation) is also the temporally oldest hadrosaur I’ve discussed so far. The Woodbury Formation is estimated to have been deposited between 80.5 and 78.5 million years ago (Gallagher, 2005). That beats out Hypsibema crassicauda of the Ellisdale site (=Marshalltown Formation, ~72 million years ago). The Hypsibema of the James King Marl Pits (= Black Creek Formation, ~84.9-70.6 million years ago) may have existed at the same time as Ornithotarsus. O. immanis was but one of the first giant hadrosaurs of the continent Appalachia. Hadrosaurs would thrive until the end of the Cretaceous, diversifying into a menagerie of forms on multiple continents. The fate of Ornithotarsus would be burial at sea, its remains eroding away until nothing but fragments remained to be found. Ornithotarsus immanis by the author. Pencils on paper, 2015. 1. Prieto−Márquez, A.; Weishampel, D. B.; Horner, J. R. .2006. “The dinosaur Hadrosaurus foulkii, from the Campanian of the East Coast of North America, with a reevaluation of the genus.” Acta Palaeontologica Polonica 51(1): 77–98. 2.Colbert, E.H. .1948. “A hadrosaurian dinosaur from New Jersey.” Proceedings of the Academy of Natural Sciences of Philadelphia 100: 23–27. 3.Holtz, T. R. Jr; Rey, L. V. .2007. Dinosaurs: the most complete, up-to-date encyclopedia for dinosaur lovers of all ages. New York: Random House. (Updated during 2012) link: PDF . 4. Baird, D.; Horner, J. R. .1977.” A fresh look at the dinosaurs of New Jersey and Delaware.” The Bulletin of the New Jersey Academy of Science 22(2):50. 5. Weishampel, D. B. ; Horner, J. R. .1990. “Hadrosauridae.” In D. B. Weishampel, H. Osmolska, and P. Dodson (eds. ), The Dinosauria. Berkeley: University of California Press. p. 534-561. 6. Weishampel, D. B. .2006. “Another look at the dinosaurs of the East Coast of North America.” III Jornadas Internacionales sobre Paleontología de Dinosaurios y su Entorno, Salas de los Infantes, Burgos, Spain. Colectivo Arqueológico-Paleontológico Salense Actas:129-168. 8. Gallagher, W. B. .2005. 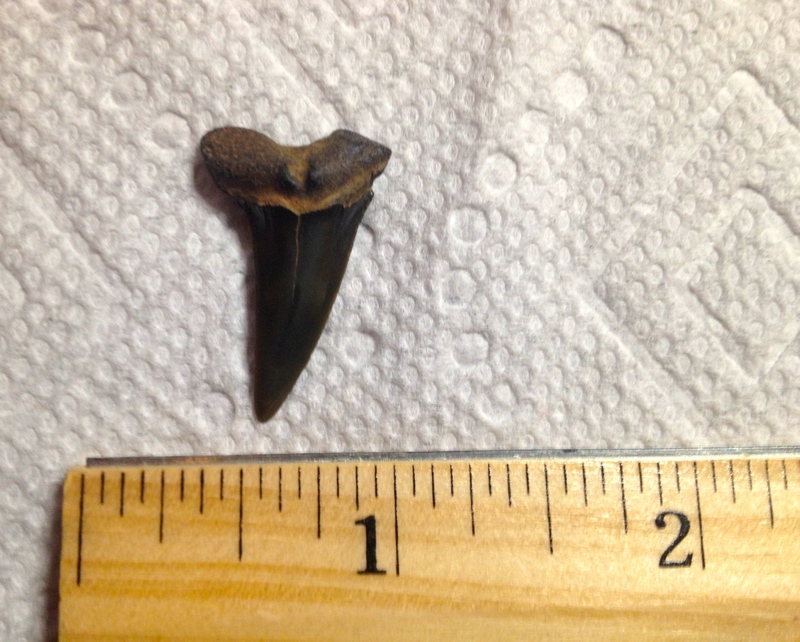 “Recent mosasaur discoveries from New Jersey and Delaware, USA: stratigraphy, taphonomy and implications for mosasaur extinction.” Netherlands Journal of Geosciences 84(3): 241. Enter Hypsibema missouriense. H. missouriense is the westernmost species of Hypsibema, and the largest animal present in the lowlands. These gigantic hadrosaurs form small herds which migrate across the plains, stripping trees and shrubs of their leaves, fruits, and seeds. Their large size means H. missourense are almost immune from attacks by predators, but the wet season brings new threats to the herd, including theropods with bigger bodies and bigger appetites. The largest predators to come with the start of the wet season are the dryptosaurs. Full grown adults can even take down a Hypsibema missouriense, and many of the gigantic hadrosaurs have scars from fights with these killers. Armed with 3-clawed hands, a mouthful of serrated teeth, and feet like those of an eagle, these dryptosaurs are well-armed carnivores. It’s midday in the lowlands, and a juvenile dryptosaur descends from its home on an outcrop to a nearby lake. Unfortunately for the young carnivore, a herd of Hypsibema missouriense have stopped to cool off, and do not intend to share the water. The hadrosaurs spot the juvenile, and start to bellow aggressively, signaling that they’ll charge. The juvenile knows not to instigate the titanic dinosaurs, and retreats to the safety of the adult members of its pack. Hypsibema missouriense is the better studied and more-well known of the two Hypsibema species. Designated as the State Dinosaur of Missouri in 2004 (See reference 1 for more details), this dinosaur was originally mistaken for a sauropod (Gilmore & Stewart, 1945). 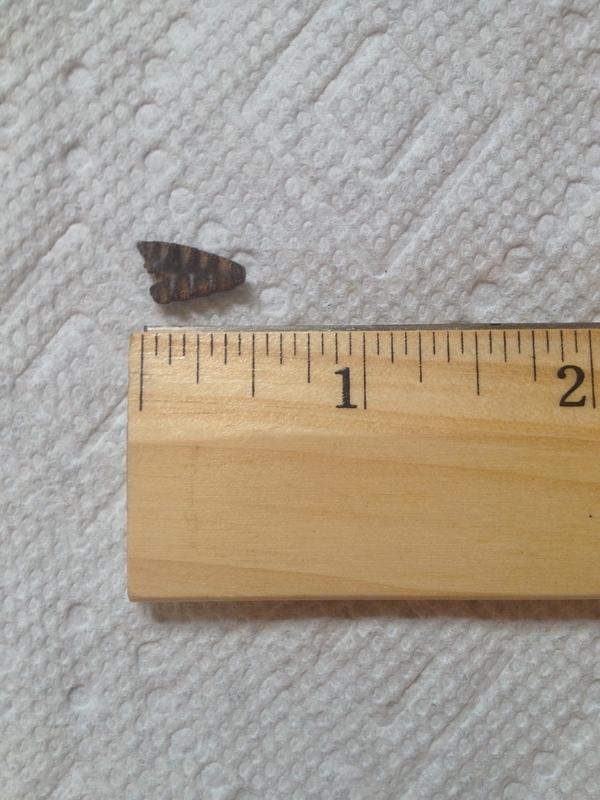 This attests to the size of the known bones of H. missouriense. All the fossil caudal vertebrae of this animal in the Smithsonian’s collection are almost 10 centimeters (3.9 inches) in length. The size of H. missouriense‘s caudal vertebrae suggest an animal of similar size to H. crassicauda. However, none of the H. missourense caudal vertebrae above equate to 10 centimeters in length, whereas the caudal vertebrae of the Hypsibema crassicauda type specimen does (the H. crassicauda vertebrae is actually slightly longer then 10 centimeters. Go check out my post here for an image of the type specimen). The longest vertebrae in the image above (rightmost row, second down) comes in at approximately 9.8 centimeters in length. 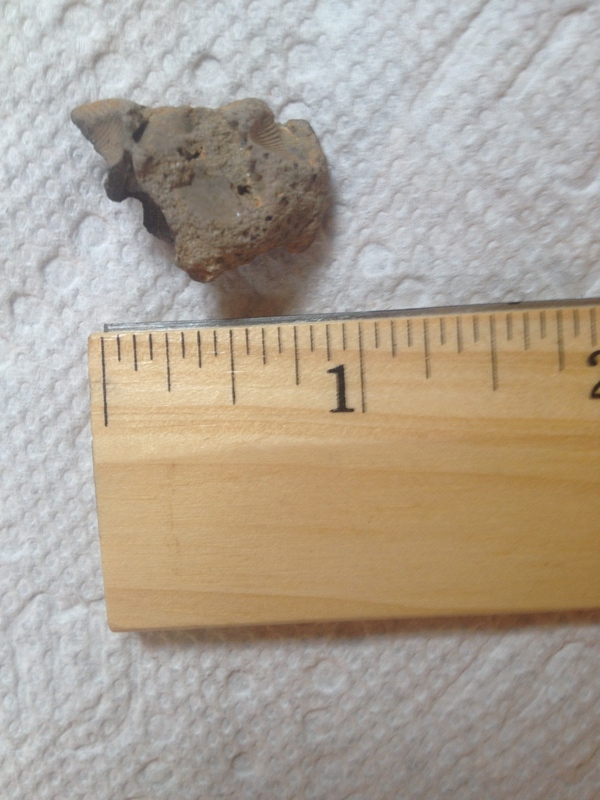 If we compare that with this 10 centimeter caudal vertebrae attributed to H. crassicauda, we realize that the length of the H. missouriense specimen is 96% of the H. crassicauda specimen. Using the length determined by Holtz and Rey (2007) for H. crassicauda (I should note that Holtz and Rey refer to H. missouriense as Parrosaurus, which was placed in the genus Hypsibema by Baird & Horner (1979)), which they determined was 49.2 feet, we can make an approximate estimate of the length of the H. missouriense holotype. We find a length of 47.2113 feet (96% of 49.2 feet) for the holotype of H. missouriense. That’s slightly smaller then H. crassicauda , but still gigantic for a hadrosaur. The caudal vertebrae above aren’t the only material we have from H. missouriense. A fragmentary dentary and predentary are known from this animal (Weishampel et. 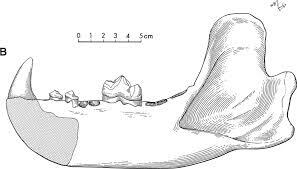 al., 2007)(Check out this page at the Bollinger County Museum’s website to see the partial dentary), as well as some phalanges (see below). From the more complete remains of H. missouriense, we can better understand how the giant hadrosaurids of Appalachia lived. During the time of Hypsibema missouriense, Missouri was situated in the southwest of Appalachia. Here, the Appalachians gave way to lowlands, which eventually dipped into the Western Interior Seaway. 75 million years ago (Campanian Stage of the Late Cretaceous) the Appalachians were eroding away. 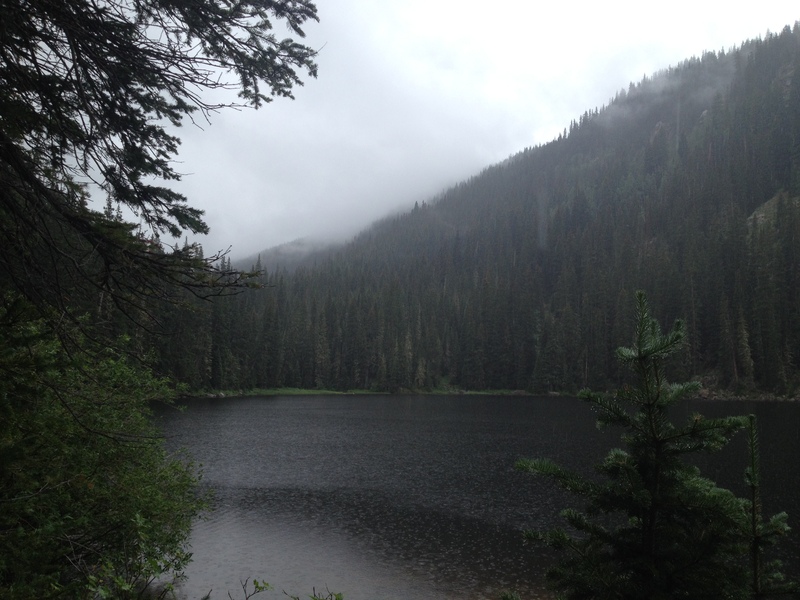 The elements slowly chipped away at these mountains, almost flattening them into the lowlands they gave way to. H. missouriense would have been witness to the last of the Cretaceous Appalachian mountains. H. missouriense itself hails from the Chronister site, a Campanian age deposit, which, in some places, constitutes as a bone bed (Fix & Darrough, 2004). During the Campanian, the Chronister site was a body of fresh water, possibly some sort of lake or wetland (Fix & Darrough, 2004). The Chronister site is very special, as it is the only locality in Missouri which produces terrestrial vertebrate remains dating to the Mesozoic (Fix & Darrough, 2004). Among the vertebrates are turtles, such as Adocus, the large amphibian Habrosaurus, and the crocodilian Leidyosuchus (Fix & Darrough, 2004). 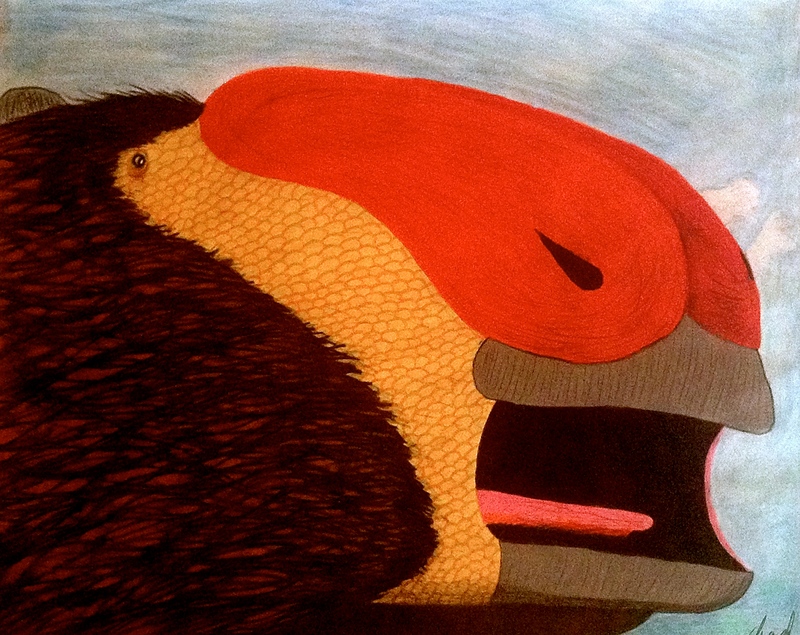 Along with H. missouriense, dromaeosaurids and tyrannosaurids make up the dinosaur fauna (Fix & Darrough, 2004). What interests me about this site, however, is its location on the western coast of Appalachia 72 million years ago. Many Late Cretaceous localities, such as the Ellisdale site (New Jersey) and Phoebus Landing (North Carolina), have yielded the remains of not only dinosaurs, but turtles, amphibians, lizards, fish, and other vertebrates. When it comes to the fossil record from western Appalachia (I am referring to the continent), we aren’t so lucky. The Chronister site gives us the unique opportunity to study what life was like on the eastern shores of the Western Interior Seaway. Yet Chronister’s close proximity to this inland sea might have caused the downfall of its native residents. When this seaway pulled a reverse-Moses, the dinosaurs of Chronister were right there in the midst of Laramidian species, some of which may have outcompeted natives like Hypsibema missouriense. Of course, we can’t be sure what happened, as we simply do not have localities in the Central and Midwestern US which preserve Maastrichtian dinosaur bones from Appalachia. For now, the fate of western giant hadrosaurids like H. missouriense is a mystery. Although we might never know what eventually happened to the giant hadrosaurids of western Appalachia, the future looks positive for the Chronister dig site. Excavations of this locality are currently being conducted by the Bollinger County Museum of Natural History. New specimens are constantly being unearthed, and the site’s bone bed will surely continue to yield exciting vertebrate fossils, along with those of plants and invertebrates. The secrets of Appalachia’s far west are finally being revealed. Hypsibema missouriensis faces off against a young dryptosaur. Illustration by the author. Colored pencils on paper, 2015. 1. “The State Dinosaur”. State Symbols of Missouri. Missouri Secretary of State. URL: http://www.sos.mo.gov/symbols/symbols.asp?symbol=dino. Accessed June 28, 2015. 2. Gilmore, C. W.; Stewart, D. R. .1945. “A New Sauropod Dinosaur from the Upper Cretaceous of Missouri”. Journal of Paleontology 19 (1): 23–29. 3. “Hypsibema missouriensis” Collections Search Center, Smithsonian Institution. Smithsonian Institution. URL: http://collections.si.edu/search/results.htm?q=Parrosaurus . Accessed June 28, 2015. 4. “Hypsibema crassicauda” Collections Search Center, Smithsonian Institution. Smithsonian Institution. URL: http://collections.si.edu/search/results.htm?q=Hypsibema+crassicauda . Accessed June 28, 2015. 5. Baird, D.; Horner, J. R. .1979. 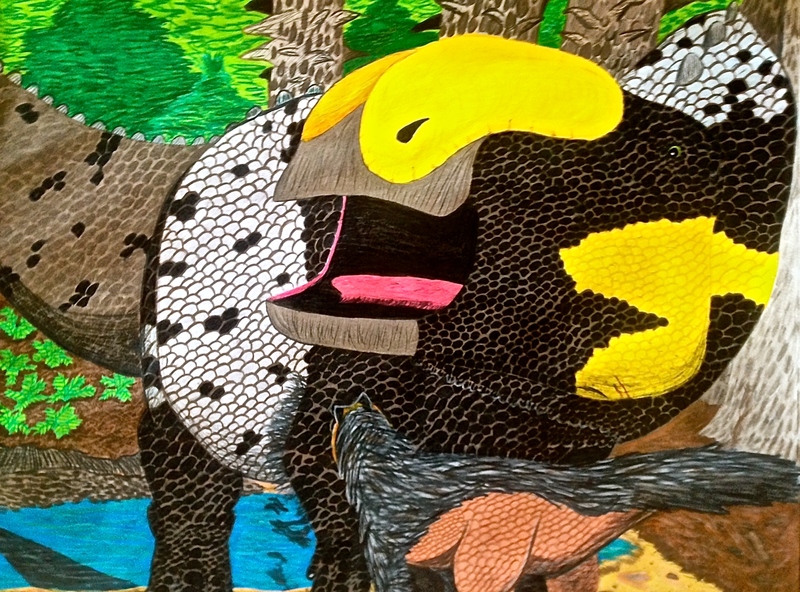 “Cretaceous dinosaurs of North Carolina”, Brimleyana 2: 1-28. 6. Weishampel, D. B.; Dodson, P.; and Osmólska, H. (eds.). 2007. The Dinosauria, 2nd Edition. Berkeley: University of California Press. p. 443. 7. “Hypsibema missouriense” Collections Search Center, Smithsonian Institution. Smithsonian Institution. URL: http://collections.si.edu/search/results.htm?q=Hypsibema%20missouriense&tag.cstype=all . Accessed June 28, 2015. 8. Fix, M. F.; Darrough, G. .2004. “Dinosauria and associated vertebrate fauna of the Late Cretaceous Chronister site of southeast Missouri.” Geological Society of America Abstracts with Programs 36 (3): 14. First off, thanks for 300 views this past month! That blows my mind. I hope you enjoy the post, and thanks for reading! Hike through any forest on the East Coast of the US today, and you’re bound to come across those small, fast sciurids we call chipmunks. Back during the Pleistocene, however, chipmunks grew to much larger sizes, as evinced by the giant, or “noblest” chipmunk, Tamias aristus. The modern eastern chipmunk, Tamias striatus, has been found to be T. aristus‘s closest relative (Ray, 1965), suggesting that the genus Tamias has an ancestry in the Eastern US. Based on the bones, T. aristus was around 30% larger then the modern Eastern chipmunk. Try thinking about that next time you go to see one of those Alvin and the Chipmunks movies! The type specimen of this animal was discovered at Ladd’s Quarry, which is a Pleistocene site in Georgia (Ray, 1965). Pleistocene Ice-Age tapir, Dire wolf, and even peccary fossils have been found at this site. A variety reptiles and amphibians were also present (Holman, 1985). Like the giant beaver Castoroides, which also inhabited the East Coast during the Pleistocene Ice Age (Hulbert et. al., 2014), Tamias aristus represents a super-sized relative of a modern species. T. aristus may have led a slightly different lifestyle then its modern-day relative, but their overall skeletal similarities suggest that T. aristus occupied a similar niche. I heard John Alroy estimated Ladd’s Quarry at around 300,000 years old based on the presence of the Vero tapir, but I haven’t seen any publications with this information. We can conclude, however, that the environment represented at Ladd’s Quarry was from an interglacial period with higher temperatures then those of today. This conclusion is based on the presence of wetland animal remains, such as those of the Florida muskrat (Ray, 1967), at the site. A variety of animals are found at Ladd’s Quarry that also are observed in the forests of the East Coast today. The eastern cottontail, white-tailed deer, and opossum are just some of the creatures that left their remains behind at Ladd’s (Ray, 1967). 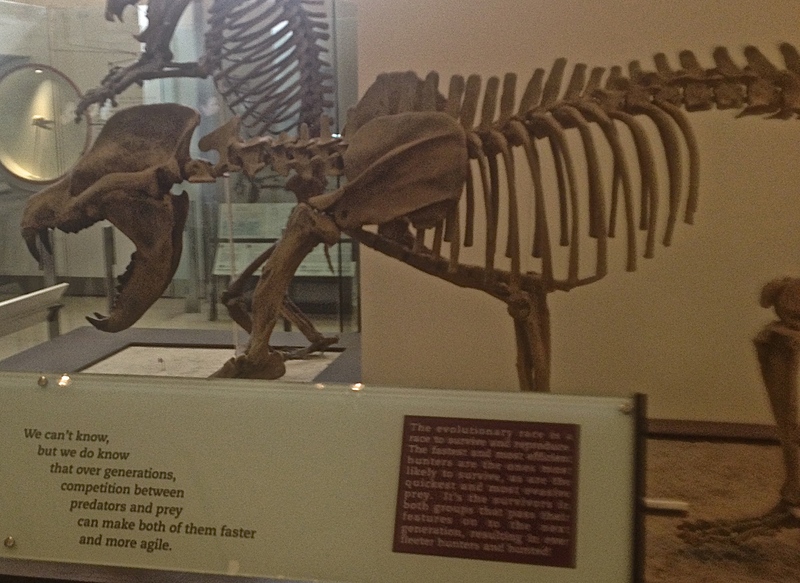 Larger animals, such as the horse Equus (Ray, 1965) and the giant ground sloth Megalonyx (Ray, 1967) are also present and were the resident megafauna at Ladd’s Quarry during the interglacial period. 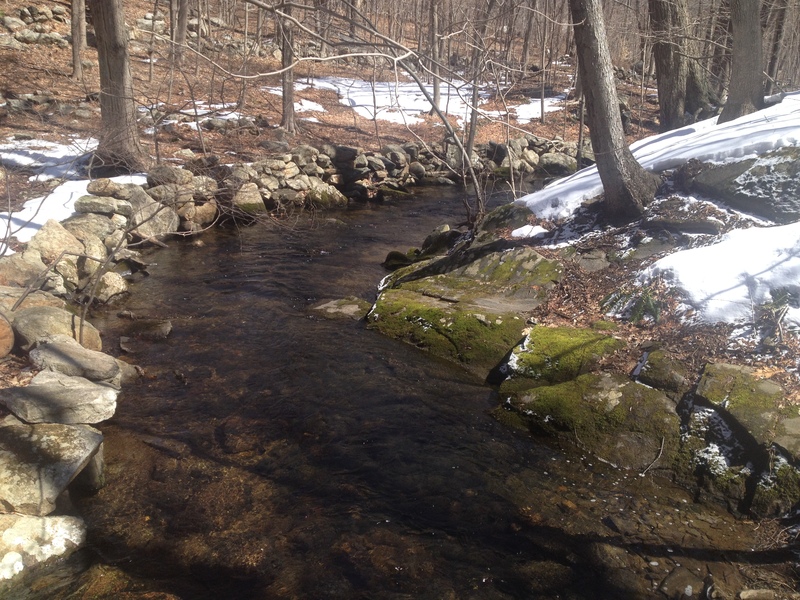 The environment which the noblest chipmunk called home was somewhat similar to this modern forest in Connecticut. Photo by the author, 2015. The noblest chipmunk (I’ll be referring to T. aristus as such from now on, as I find the name adorable) may also be known from Ice Age deposits in Florida. I can’t confirm the presence of this animal in Florida for lack of good references. However, the site fossilworks.org indicates T. aristus existed among the fauna of the Florida site Arredondo IIA, which dates to the Sangamonian interglacial stage. 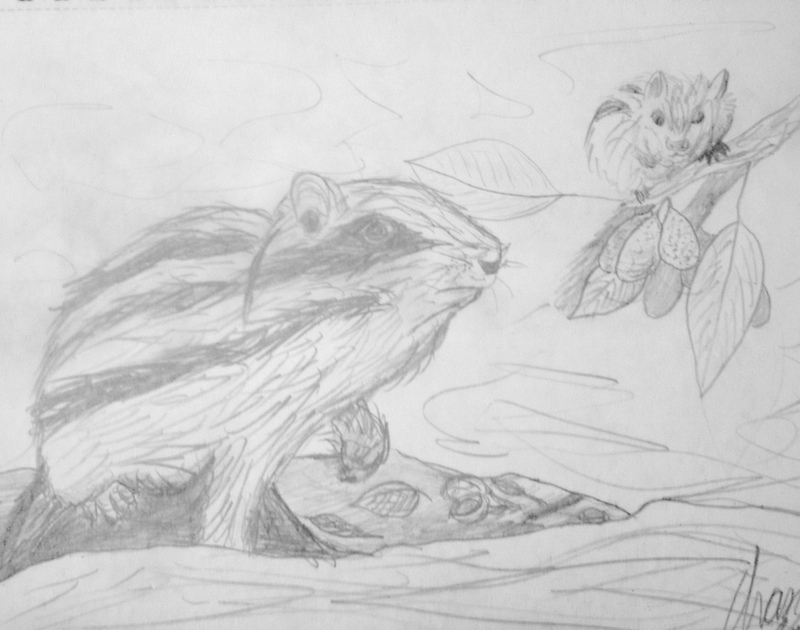 If the noblest chipmunk was present in Florida during the Sangamonian, it indicates that the chipmunk was able to survive through glacial periods, and also extends the noblest chipmunk’s temporal range by ~182,000 years (this is all based on whether Ladd’s Quarry actually represents a 300,000 year old deposit, which some have argued against) . In Florida, the noblest chipmunk would have co-existed with many of the same species with which it came into contact at Ladd’s. But let’s go back to the noblest chipmunk’s niche. As I said above, we think that the noblest chipmunk and the eastern chipmunk had similar niches. The size of the noblest chipmunk, however, suggests that the noblest chipmunk had a slightly different lifestyle then T. striatus. An Eastern Chipmunk foraging for Walnuts (Juglans sp.) stops to ponder at its larger relative, the noblest chipmunk Tamias aristus. Illustration by the author. Pencils on paper, 2015. But this chipmunk’s reign as king of the forest floor was not to last. More extreme glacial intervals destroyed the noblest chipmunk’s habitat. The smaller, more adaptable Tamias species survived. Forests gave way to grassland during glacial periods. 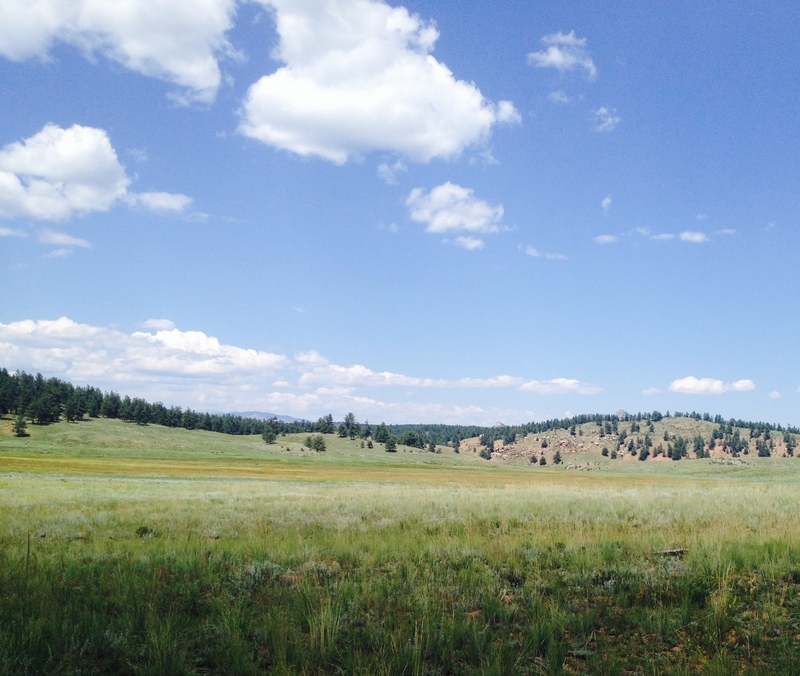 If you’re an avid paleo-enthusiast, you might recognize that this photo is of Florissant Fossil Beds National Monument. Photo by the author, 2014. During its heyday, Tamias aristus ruled the roost on the forest floors of Ice-Age Eastern US, its bones still preserving an ancient chipmunk legacy. 1. Ray, .C. E. . 1965. “A new chipmunk, Tamias aristus, from the Pleistocene of Georgia.” Journal of Paleontology 39(5):1016-1022. 2. Hulbert, R.; Kerner, A.; Morgan, G. S. .2014. “Taxonomy of the Pleistocene giant beaver Castoroides (Rodentia: Castoridae) from the southeastern United States.” Bulletin of the Florida Museum of Natural History 53(2):26-43. 3. 3. Holman, J.A. .1985. “Herpetofauna of Ladds Quarry.” National Geographic Research 13: 423-436. 4. Ray, C. E. .1967. “Pleistocene mammals from Ladds, Bartow County, Georgia.” Bulletin of the Georgia Academy of Science 25(3):120-150.